Palak Paneer - An Indian Recipe For Cottage Cheese Cooked In Spinach Puree. 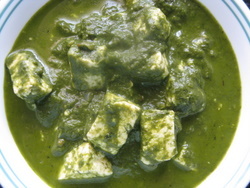 Palak Paneer Recipe - Fresh Cottage Cheese Prepared in pureed spinach. This Palak Paneer recipe is an easy spinach recipe with very subtle flavors of spices. It is a very popular Indian vegetarian recipe. Do I even need to mention that spinach recipes are very nutritious? Spinach or other greens should be included in our diet. Spinach is an excellent source of carotenoids, potassium and folate. It also contains good vitamin C but unfortunately it gets lost in the cooking process. Cottage cheese can be made at home by using milk (low fat/full fat that's your wish) or else bought ready made from any supermarket. How to prepare cottage cheese at home? Take a liter of milk(any) and boil it. To this add about 3-4 tbsp of vinegar mixed in equal amount of water. Simmer a minute and when water separated from the milk turns sea green turn the heat off. Line a colander with a muslin cloth and strain out the water. as much water as you can by pressing it with your hands. You will be left with a white ball of soft cheese. Tie it tightly and keep some heavy weight on this. Place it somewhere where the water from it gets easily drained. After 3-4 hours you will have a more solid block of cheese. Keep it in the refrigerator and use as desired. Please try not to substitute the cottage cheese with Tofu(bean curd), your dish will not taste the same. If you want to avoid cottage cheese, then try this recipe with mushrooms instead. In a deep pan/kadai heat the oil and crackle the cloves and cinnamon. Add the garlic and saute a little, then add the onions and on a low flame allow them to soften a bit. When they turn light brown, pour the spinach puree, bring to a boil then cover and simmer for about 20-25 minutes. Stirring occasionally in between. Add the milk and continue to simmer for 3-4 minutes. Now add all the other dry ingredients (powders) and the paneer (cheese cubes). Cook for 4-5 minutes on a low flame. Finish with some cream (optional). Serve this delicious palak paneer with chapati/Roti or any other Indian bread.